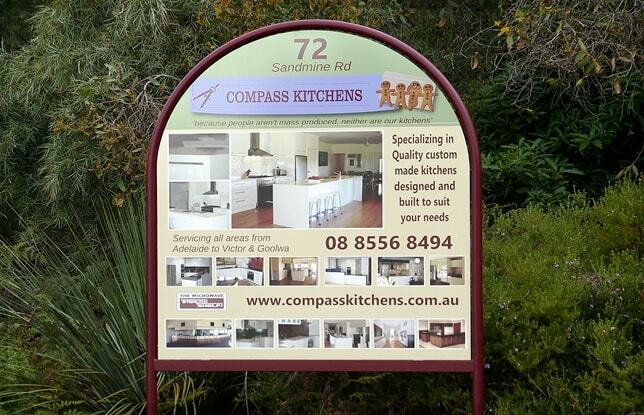 Adelaide Kitchen Renovations | Custom Made Solid Timber Kitchens. 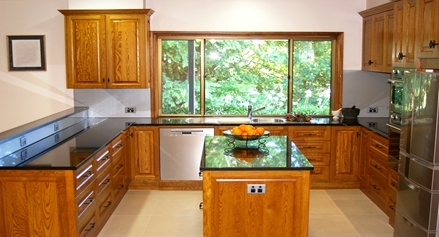 A warm American Oak Timber Kitchen Renovation with Black Galaxy Granite tops and a modern feel. 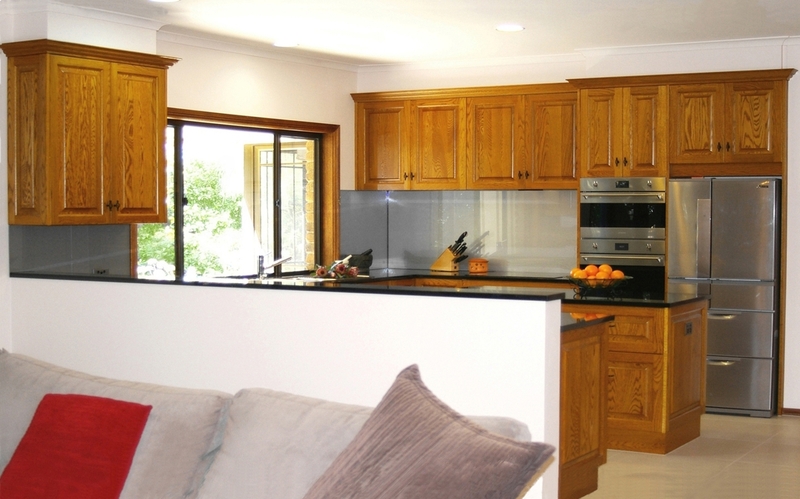 Our clients at Willunga had first made contact with us; in need of a new Kitchen Renovation because their existing Kitchen had deteriorated due to water damage. Their existing kitchen was in a Solid Timber style that suited the accompanying woodwork and architecture of this lovely home. 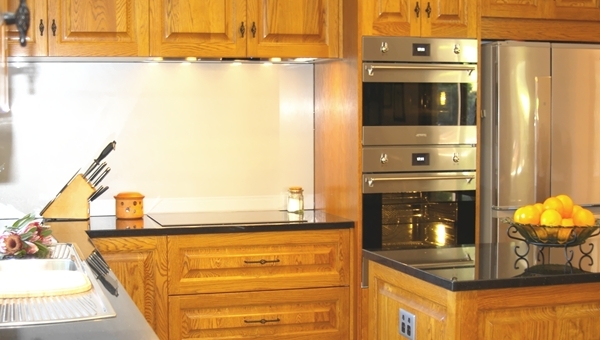 Our clients therefore wished to keep with a Solid Timber Style, but to bring this style and the kitchen features up to date. We took this opportunity to change the design and the layout of the kitchen’s work-flow whereby opening it up to the Lounge and Dining rooms; and making it a more open social space to be in. 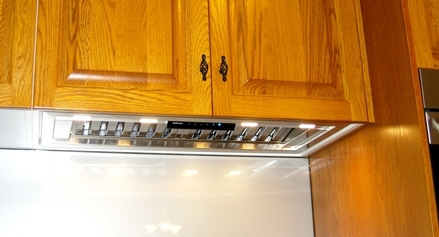 We also added more dedicated storage space with easy access and functionality. For this new kitchen we also had the space to add a central Island Bench; providing additional work space and Drawer Storage for bulky appliances and cookware; placing these close to where they are being used. 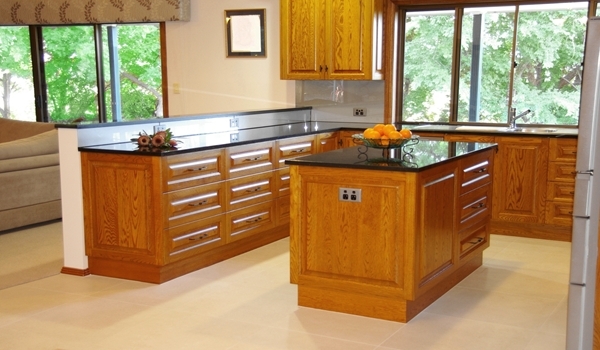 Our clients selected Black Galaxy Granite Counter Tops, which has a Gold Broncite fleck within it that picks up on the Golden tones of the solid American Oak doors and Panels chosen. 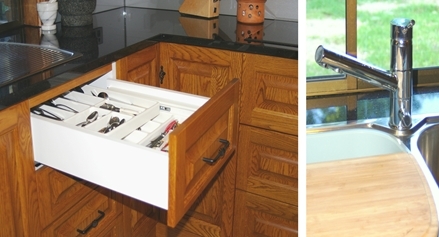 We incorporated 22 wooden Drawers into our design, which all have quality concealed, Full Extension Soft Close Blum Runners. 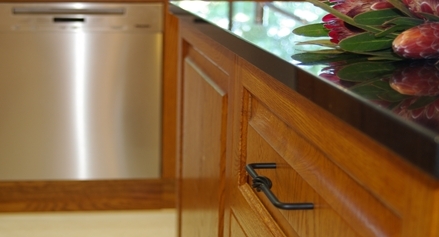 We then dressed the cabinets with Black French Twist “T” Handles and D pulls, matching the counter tops while also complimenting the Solid Timber Style and homes Architecture. Our client selected modern style Smeg Induction Cook top in black that blends seamlessly in with the Black Granite and then paired this with a silent and concealed Undermount Rangehood by Falmec ,which we ducted out to the atmosphere where this units the fan and motor is in the flue itself which sits outside the kitchen and dramatically reducing any Rangehood noise. Our Client also chose a Satin Stainless Steel wall Oven, a stacked Built-In Microwave, a Mitsubishi French Door Refrigerator along with a quality Australian made Oliveri Monet double bowl sink, where we then picked up on this Stainless Steel and the Grey colours in their soft furnishings to use a Light Grey Metallic for the Glass Splashbacks that were then complimented with Grey Metallic Low Profile HPM Power Points; giving this Timber Kitchen Style a modern up-to-date look. We used a Culino three in one rain water mixer tap into the design and incorporated a Double Slide-Out Waste Bins under the sink, a Two-Tiered Cutlery Tray with top Tray on runners which roll back to expose an extra layer of cutlery storage, a space to store shallow trays and cutting boards on edge and dedicated drawers for easy storage of our client's items including one for our client’s tall Bread Maker and Food Processor. Our clients then finished off this renovation with their selection of large format Porcelain Tiles in a light bone colour which have a flat matt finish.